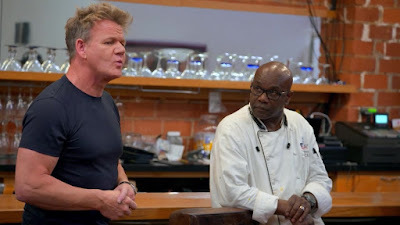 In this 24 Hours to Hell and Back episode, Gordon Ramsay visits Brownstone Bistro. Brownstone Bistro is a creole restaurant in Los Angeles, California owned by Clive Jackson. The restaurant has been open for five years and is now struggling. Gordon has been secretly recording the restaurant and finds the staff fooling around and customers comments. Clive was a chef for a cruise line and a movie studio and the restaurant was initially doing very well with lines out of the door. But sadly Clive lost his son and after this Clive, his family and the restaurant began to suffer as Clive is too involved, refusing to take a day off. Gordon arrives in disguise with local food critics and finds no host and no greeting on arrival. They order staple dishes such as lobster mac and cheese, jerk wings, grilled rib eye and more. The wings are cold in the middle, the lobster mac and cheese has no lobster and artificial cheese and the ox tail has huge slices of pineapple. Gordon removes his disguise and introduces himself to the staff and gives feedback on his experience in the restaurant. They go out to his Hell on Wheels truck and shows them the hidden footage including staff goofing around and unsafe food hygiene. Nicole laughs and is stand offish with Gordon. Gordon reads customer reviews to the staff with a number of poor comments on service and Terrance the line cook quits. The renovations begin and Gordon finds a mess of undated produce in the walk in and the kitchen is filthy and caked in grease. Gordon meets Clive in his office and they discuss the murder of his son at 14, to which he was nearby and first on the scene. As a result of this he hires a number of young staff to try and give them a chance. Clive reveals that his wife had left him just a week ago. The staff get to work cleaning the restaurant and the chefs are introduced to the new dishes in the truck. Gordon talks to Nicole and they discuss the service in the restaurant, he recognises that she can be a good boss but she needs to step up. The staff are introduced to the new menu and they love the new food. The kitchen is clean with new equipment and more space and a new tablet POS system is introduced. Gordon invites Clive's wife Deedee to the restaurant to talk with Clive and Gordon leaves them to talk. They are introduced to the new look restaurant and the blessing tree in the centre, dedicated to Clive Jr. On relaunch, the customers love the new decor, the new food and the new customer service. The VIP table of food critics order everything, one critic is left waiting for jerk chicken but it is rushed out and is under cooked, Nicole deals with the situation well and the critic loves the dish. Three months later and business has picked up, the restaurant is busy and customers are loving the menu. Brownstone Bistro is open and reviews are mostly positive, Trip Advisor reviews to be mostly positive with positive comments on both the food and atmosphere of the restaurant. Yelp reviews are very positive and the buffet appears to be a huge hit with customers for both cost and quality of food. He has kept the menu that was introduced in the show and has added customer favourites alongside a buffet service on Thursday, Friday and Sunday. Brownstone Bistro closed in October 2018, the doors were locked and phones disconnected. Brownstone Bistro re-opened on January 27th 2019. There are new owners and the restaurant has been renamed to Brownstone LA. They have kept Clive's menu. Brownstone Bistro was aired on June 27 2018, the episode was filmed in October 2017 and is 24 Hours to Hell & Back season 1 episode 3.